You can listen to 'Darker shade of grey' here. Matt Harlan tours The Netherlands in the coming ten days. Here you find out where. Hence we do a re-run of our review of this spring. Below is a link were you can order the album. It's best of course to support Matt directly and buy the album from him at a gig. Houston based singer-songwriter treats us to a new album. It's not the first time he features on WoNo Magazine's blog. You can read our interview with him here. What struck me most, is the way he translates his observations into lyrics and songs. 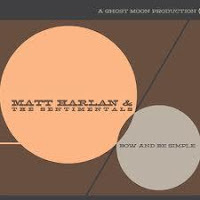 Bow and be simple is Harlan's second album and every time I've played it in the past days, I liked it a little bit more. Don't expect anything fancy or flash, but some good and honest song-writing, as he sings in 'Simple song: "I tried to write a simple song. Something closer to the truth" and comes up with an almost haunting vibe accompanying this truth. So whether he managed to write a simple song, sort of hangs in the balance. What he did manage, is to hide any traces of sophomore album anxiety. If he ever had any that is. Bow and be simple is a somewhat different album then I'd expected on the basis of his first album 'Tips & compliments' and his solo performance with those songs. T &C is, as I remember it, an album with more or less one vibe and can be characterized as steeped somewhat more into country and observing from the lyrical point of view. On his new album Harlan flexes his muscles, but in a very slow but deliberate way, while he plays around a bit with the mood of his listeners as well. Harlan takes us through several styles of Americana. From slow songs with fine electric guitar playing, that give the songs a somewhat haunted vibe like 'Simple song', to up tempo country songs like 'The easy road', next to pure singer songwriter outings like 'Baby blue'. The differences clearly lend the album character and a bite as soon as the dark guitar sounds kicks in, which sound is not totally unlike the sound of Madrugada's guitar player, the late Robert Buras. The album was made with the Danish musicians named The Sentimentals. They deserve the complement that they clearly bring out the best in Matt Harlan. The arrangement of the songs give them all a distinct individual charm and quality, while the harmonising vocals by Rachel Jones definitively give several songs another extra lift. Let's hope that it's possible for Matt Harlan to take this band on the road with him, during his fall European tour of 2012. As to references, I hear some Adam Carroll simmering through in some of the more up beat songs and Grayson Capps in the electrified slow ones. (Harlan even looks like a younger version of Capps on the front of the booklet.) Bob Dylan in his 'Nashville skyline' period in 'The easy road'. His voice has faint traces of the young Stephen Stills. Mostly though, he is his own man with an album full of stories set to a great variety of music. Should there be any self doubt towards his music, when he sings "Is anybody out there? Do you hear my song"? in 'Baby blue', I'd like to take the opportunity to answer him right now. Bow and be simple is a step forward in Matt's song writing and holds promises for what's to come. This line tells all : "And there's a thimbleful of stories, that I can't quite talk about", from 'Darker shade of grey'. So bow and be patient. I bet on sky. Dinosaur Jr.